As your loved ones get older, they can start to become forgetful. Whether they live in an assisted living home or simply like to visit the park, they may start to find that they are forgetting their things or getting them mixed up with their friends’ belongings. 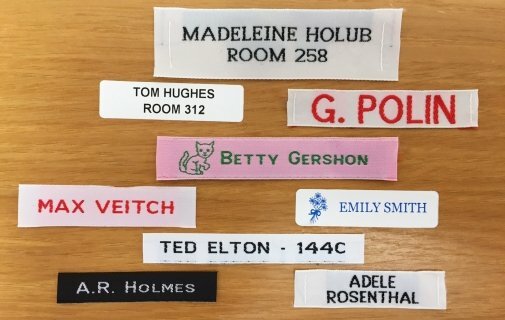 Labels from It’s Mine Labels can greatly help diminish the confusion, grief and loss that comes with growing older and becoming more forgetful. Here are three essential labels for seniors. Sew-on woven labels can have block lettering that is easy to read, and allows you to easily identify valuable clothing without adding a bulky or uncomfortable tag. Sew-on clothing labels can also be removed if necessary. Iron-On satin labels are extra smooth and soft, and are perfect for those with sensitive skin. A range of lettering styles, colors and icons is available, and they are very easy to attach to clothing and linens. Stick-on Standard labels are perfect for most other hard possessions, including pill bottles, toothbrushes, knitting supplies and more. The labels are simple with one or two lines of text, and will not wash off or deteriorate when exposed to heat or moisture.